On May 11, 2017 Conti Solar participated in the commissioning ceremony of a successful renewable energy project in Falmouth, Massachusetts for Citizen’s Energy Corporation. Conti provided engineering, procurement and construction (EPC) services for this 4-megawatt installation. 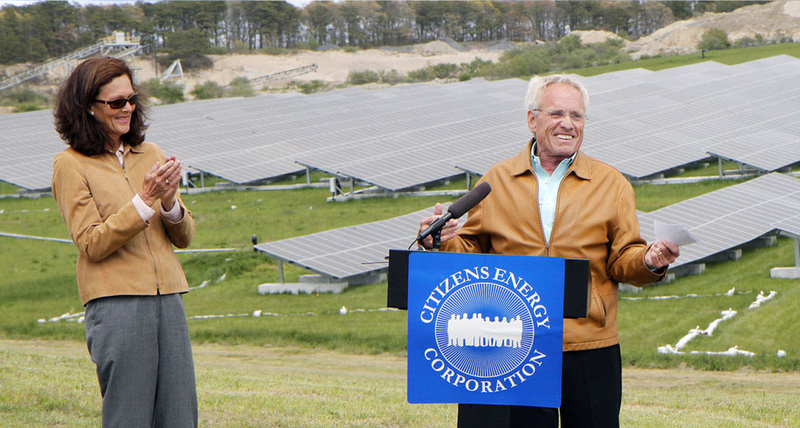 At the ceremony, Citizens Energy Chairman Joseph P. Kennedy II was joined by Falmouth business leaders and elected officials in pulling an electric switch to mark the flow of clean, green electric power from a utility-scale solar array built by the company atop an unused landfill. Appearing with Kennedy were Falmouth Board of Selectmen Chairman Doug Jones and Falmouth EDIC Chairman Michael Galasso. The array occupies 16 acres of an inactive landfill, putting the property back to work for the benefit of local residents and businesses. Over the project’s 20-year lifetime, it will return $14 million in economic benefits to the town through energy savings, lease payments, and a payment in lieu of taxes agreement—as well as supporting Citizens Energy’s charitable mission. The renewable energy produced by the array will yield health and environmental benefits as well, annually displacing 4,000 tons of carbon from fossil fuel plants, the same footprint of 500 homes or 450 cars.